Hermit crabs can be fun pets and are ideal for beginners as well as experienced pet owners, but they do require proper care to stay healthy and comfortable. Cleaning your hermit crab's habitat is essential to that health and comfort. While crabs don't get housekeeping services in their native habitats, a pet hermit crab's habitat is a more confined environment that can get quite dirty. Waste buildup, spilled water, uneaten food and exoskeleton molting residue can all contaminate a tank, leading to strong odors and dangerous bacterial growth. This can create discomfort and disease, and will stress the crabs, making them more vulnerable to illness and anxiety. A clean habitat is a healthier environment and will keep your crabs happier for long, enjoyable lives. Regular cleanings are important to keep a hermit crab's habitat in good condition, but the exact cleaning schedule will vary. A larger habitat with fewer crabs will not need cleaning as often as a smaller habitat with a larger crab collection. Simple cleaning chores such as spot cleaning or taking care of obvious messes should be done daily, with more intense dedicated cleaning every week or two as needed. Full, deep cleanings may be required monthly or only once every few months, depending on the habitat and the health of its residents. In a well-balanced habitat, deep cleanings may not be necessary at all, but if there are signs of gnats, mites or flies, or any strong or sour odors, a deep cleaning can be the best solution. When you're ready to clean your hermit crab's habitat, whether it is just a quick spot cleaning or a deeper, more thorough cleaning and sterilization, certain techniques can be most effective. For a deep cleaning, set up temporary housing the crab(s) can use for a day or two. You will need to set up this temporary tank several days before the cleaning to be sure the temperature and humidity is suitable for the crabs to avoid excessive stress. For simple cleaning chores, the crabs can be moved to a "play pen" while you clean their habitat. To clean the sand at the bottom of the habitat, use a sand scoop to filter out debris or wet clumps every day. For a deeper cleaning, remove the sand completely and either replace it or bake it in a thin layer in the oven at 250 degrees for 25-30 minutes to kill any bacteria. 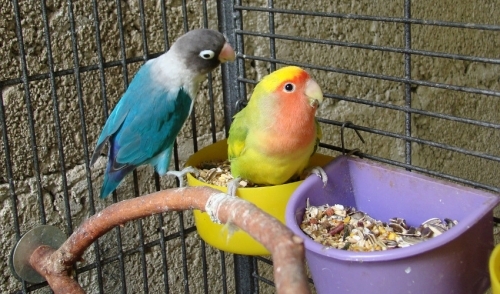 The sand should be completely cooled before being placed back in the tank. 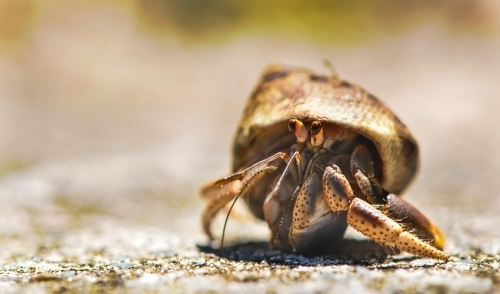 Hermit crabs are sensitive to chemicals, particularly bleach. A vinegar solution or biodegradable cleaners are the best options if any cleanser is needed – in many cases, plain hot water will be sufficient. To avoid any unintentional chemicals, use filtered water or water that has been set out to "age" for 24-48 hours before use, as any additives will evaporate in that time. Boil empty shells and toys for 2-3 minutes to thoroughly clean them. Live plants, wood and rocks should not be boiled, but should be wiped thoroughly with very hot water. All items should be allowed to dry completely before being replaced in the habitat. Any leftover chemical residue will break down as the items dry. Wipe the tank sides, bottom and top well with very hot water or clean with a biodegradable cleanser. If a cleanser is used, rinse the tank thoroughly to remove any residue and allow the tank to dry before reassembling the habitat and returning the crabs to their home. When reassembling the tank, put toys, hidey-holes and climbing obstacles in different positions, or swap out a few toys if possible. This will provide better stimulation for the hermit crabs, keeping them entertained and engaged. Boredom can lead to stress and anxiety, and if they have new places to explore, the crabs will be happier and will enjoy their home more. Cleaning your hermit crab's habitat should be a regular part of your pet care routine. When you know how best to clean the habitat, you're able to take proper steps to keep your crab healthy and comfortable for a long and happy life.